Keyn’s sculpted back supports you from the moment you sit down. Sit back, and it gently reclines, opening up your body as you change position. Keyn’s cantilever design brings comfort and elegance to a meeting room, as a side chair for quick collaboration, or in a home office environment. ► Please note that this product has not been tested to the relevant UK fire regulations and should therefore not be purchased for use in residential premises. The Keyn Chair with cantilever base is an elegant addition to a work place. Designed with comfort in mind, Keyn’s sculpted back supports you from the moment you sit down. The highly patterned back ensures you remain cool and comfortable, no matter how long you are seated for. For extra comfort, Keyn responds to your every move, gently reclining as you adjust your posture. The Keyn cantilever chair is stackable to four high. Meetings are a constant feature of every office worker’s day. What’s missing from most of them, however, is a comfortable chair. Without one, people lose attention, become fatigued, and disengage. The same can be said for any place people gather to collaborate. To address this problem, we worked with forpeople, a London-based design company, to create the Keyn Chair Group. A range of meeting and side chairs, the group offers natural comfort to support people as they move and change their posture during meetings, which is good for their minds and their bodies. When you sit upright, Keyn provides instant comfort through the sculpted back. It remains in contact with your spine from the moment you sit down. As you shift and adjust your position, Keyn’s patented CradleFlex movement responds with you. It reclines smoothly up to 10 degrees whilst allowing the seat to move forward at the same time. You are supported as you change posture, which according to research can be as many as 53 times an hour, so you can be more comfortable and remain focused. In addition to Keyn’s responsive comfort, the moulded seat back in the seat-pad version meets rigorous cleaning protocols. It features a tough yet flexible polymer material that makes it particularly relevant for high-traffic areas such as cafés. 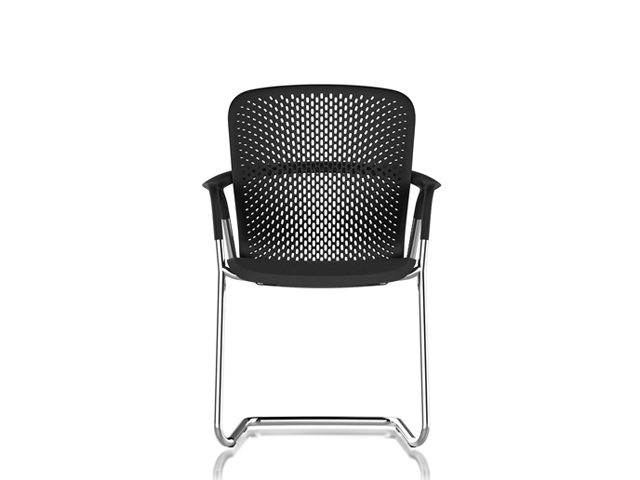 The chair’s detailed pattern not only contributes to its lightweight aesthetic but also provides ventilation to keep you cool as well as supported. 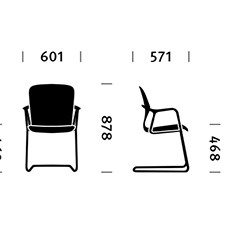 When approaching the design of the Keyn Chair Group, forpeople were determined that every version of the chair would retain the same visual appeal. To achieve this, they designed every chair in the group from only four key parts: base, cradle, seat shell, and a selection of upholstery options. The latter ranges from a simple seat-pad through to fully upholstered versions. Together these four parts create a universally elegant aesthetic, which can be transformed through colour, material and finish choices to create a variety of styles for any space. Combine a clean white finish with fresh bright colours for a casual area. Choose a polished base and fully-upholstered leather for an executive feel. The reverse contrast option brings a burst of accent colour to a more restrained palette. A design company that has partnered with Herman Miller since 2009, forpeople follows a design philosophy that is contained in its name. The people of forpeople believe that design is not an abstract, theoretical exercise. It is first and foremost for the people who use it. All of forpeople’s work – design for products, services, experiences – starts with how people feel, think and do. And it ends with improving people’s lives. Wash surfaces with a soft cloth soaked in mild detergent and warm water. Rinse thoroughly and dry with a soft cloth. Wet cheesecloth in a nonabrasive cleaner, like liquid dish soap, and rub the trivalent chrome component lightly until the original lustre reappears. Dry the component with a soft cloth to remove any soap residue. Do not use abrasive, acid, alcohol–based, or solvent–based cleaners; they may damage the finish. Vacuum fabric as needed using an upholstery attachment. Do not apply water or any liquid solution. Wetting the fabric with any liquid solution may result in permanent damage. If further cleaning is needed, dry-clean or spot clean with solvent cleaner. Do not dry the stain completely or it may set. The longer a stain is allowed to remain on a fabric, the more difficult it is to remove.